ACS 2013 is fading away now. We’ve all gone back to work. The rarefied atmosphere of Cheese Camp is something I think we all try to hold onto a little, but real life intrudes. But… I have a few more posts about ACS to make before I let it go away completely. I mean c’mon, I haven’t even talked about the award ceremony yet. In an earlier workshop someone tried to hand me a California flag. 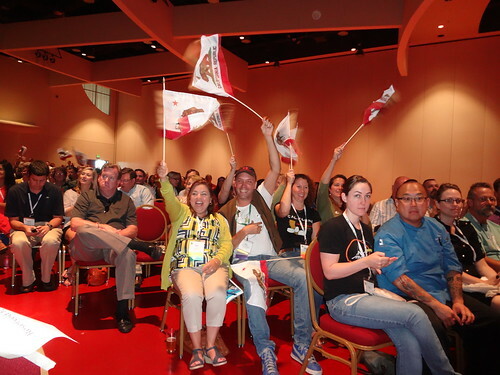 * As a judge, who would be sitting in the judge’s area, I felt like I had to refuse but I have to admit it amused me that every time a California cheese won a ribbon, Californians yelled and waved their flags. Doing this in the heart of Wisconsin definitely struck a nerve because I was later pointedly informed by Wisconsinites that Canada took more ribbons than California. ** I was also told that they would “take the high road” and not visibly display Wisconsin pride at the awards ceremony in Sacramento next year. We’ll see. When I was judging for the Best of Show I did what I usually do. I narrowed it down to about eight cheeses and then gathered a piece of each, sat in a corner of the room, and tasted them off against each other. While entries are anonymous, they have codes on them so that we can place our votes. The cheese company code is always the first number. Imagine my shock when I realized that three of my top six cheeses were from the same company! My clear #1, though, was Winnimere from Jasper Hill. It’s a seasonal cheese, but they made a special batch just for the competition. It was perfect. Perfectly ripe, grassy, beefy, mustardy, rich, oozy, and complex. This has long been a favorite of mine anyway and it was nice to see it arrive for judging tasting as good as it does in the store. Congrats Jasper Hill folks! This was a well-deserved win. And no, you cannot have any until November-ish. 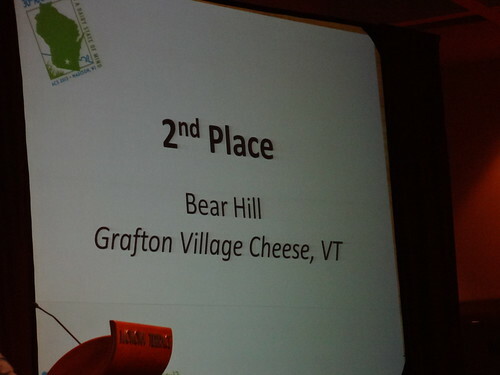 #2 in the Best of Show voting was Bear Hill from Grafton Village Cheese Company. 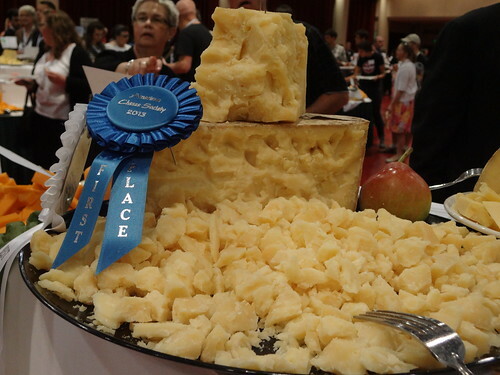 Not just a Cheddar-maker anymore, Grafton has been working on sheep cheeses and different styles. I didn’t vote for Bear Hill but I had it (unofficially) ranked 4th or 5th in my head. 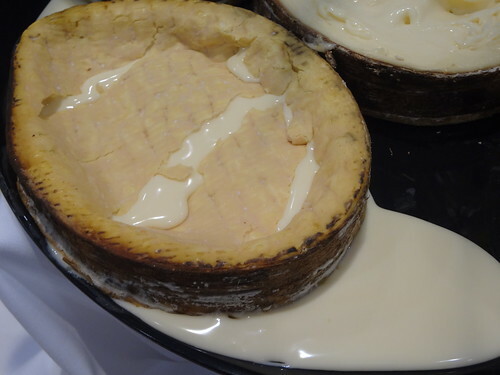 100% “Alpine Style” sheep milk cheese… we are getting some in, but again, not for a couple of months. 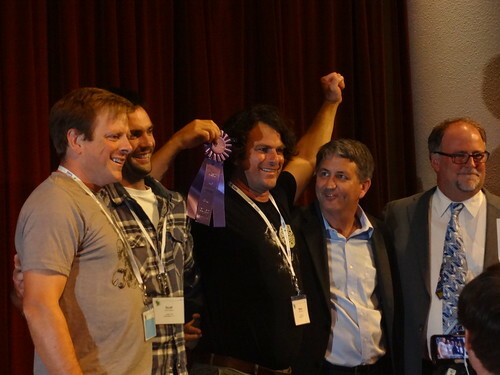 Tying for 3rd place were the two cheeses I ranked 2nd and 3rd. *Have any of you ever heard this pear thing? I don’t know if I am buying it. **Let’s pause to remember than Canada is a country, not a state, for comparison purposes. ****I’m just kidding you guys! I still love you. 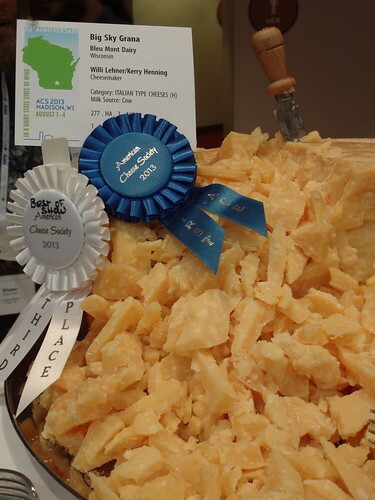 This entry was posted in Uncategorized and tagged ACS 2013, american cheese society, Best of show, bleu mont, cheese, grafton, jasper hill, winnimere. Bookmark the permalink. that picture of winnemere kind of took my breath away. i mean hello you oozy little darling! i’m ready for fall cheeses now. The pear thing is indeed weird — I think I am with you in your skepticism. Particularly given the surnames of Bartlett’s two lieutenants. Thanks for the wrap-up post. Can I make my “V is for Vermont Victory” gestures now?